"Mind the gap between the train and the platform. This is a central line train terminating at West Ruislip." Ah the wonderful morning and evening commute to and from work. We all recognise the routine: Waking up at an ungodly hour by the alarm clock, just as we were going deep into a dream. Time for work! Not another day at work! Hiding under the duvets and refusing to get out. "The alarm clock is lying," so you tell yourself. Then you realise you have a huge project, whose deadline ends today at 11am plus there's that new client meeting at 9:15am. You gave yourself what you thought was only a few seconds extra in bed, and then realise it was actually 15 minutes. "Aaah, must get out of bed." Whoops. The quick makeover occurs; for the boys, they quickly shave, for the girls we hurriedly put on our make-up and heels. From a frog to a a well-groomed city boy. From beast to a beauty. We see the time. 10 minutes late. No time for breakfast. Uh-oh. Stomachs growling. Bleurgh. The client you're seeing at the 9:15am meeting isn't going to be particularly impressed when he hears the growls. What to do? What to do? No time to pop into Pure for a quick green energising smoothie and egg wrap. Nope. No time for that Starbucks' soya milk latte with extra shots of espresso (the queue is just so long). Lo, behold. I present to you the drink that will curb those growlings and brighten up the morning and evening commutes: Upbeat! Upbeat is is a high protein dairy drink from The Whey Company. It comes in two different flavours; mango & passion fruit and strawberry. They have recently introduced a new flavour, blueberry & raspberry, but I haven't come across this in any Holland & Barrett branch yet. 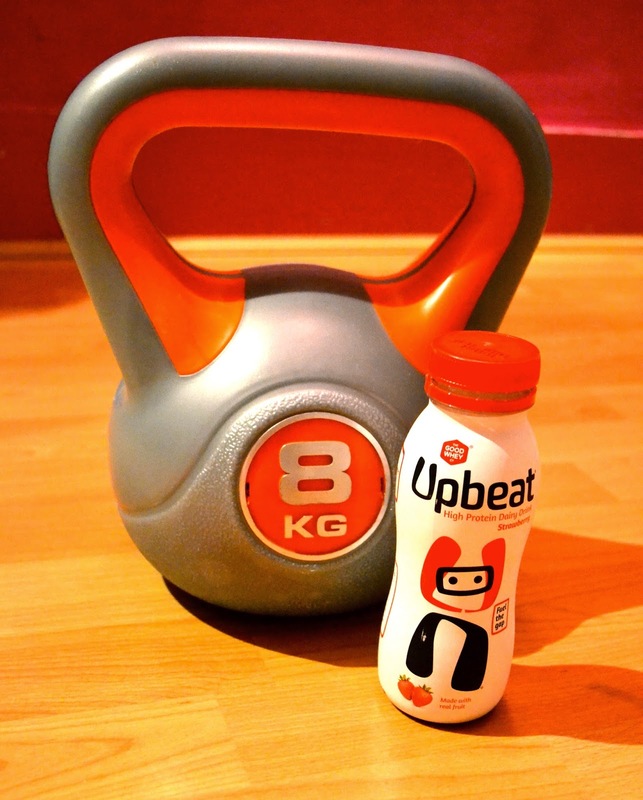 I was quite fascinated with Upbeat as the drink is marketed as a high protein dairy drink. I have to admit that I have my days where I struggle to have a good intake of protein so this drink sounded so fitting. Plus, I love to support British brands and businesses, and the Upbeat drinks contain whey protein from British milk. Thumbs up already! As someone who has entered the wonderful world of work (adios student life! ), I must admit that I have my days when I skip breakfast because I spend too long getting ready (girls, you know what I mean). At 250ml, it's a perfect size that can fit into your handbag or briefcase, so even if you don't drink it in the morning, you can pop it in the fridge and drink it whenever you want (as it's made from fresh milk, it is classed as a chilled drink and must be drunk before it's best-before-date). Or, you can pop into a nearby store and buy one (they're kept in the refrigerated section!). Again, it's perfect for those of us on the go. Bag from Zara, wallet from Cath Kidston, drink from Upbeat. 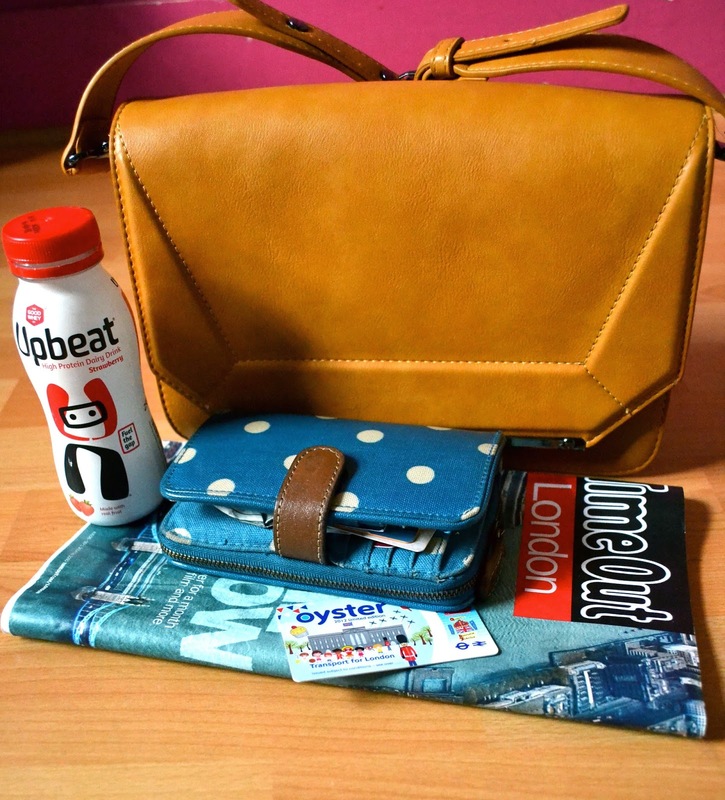 Upbeat is a perfect size that snuggles well in many bag sizes. Upbeat is different from other drinks that are on the market shelves at the moment. I guess you could say that it is channelling into the increased interest in healthy lifestyles. It is designed for everyone, regardless of whether you go to the gym 5 days a week or none at all. Whey protein is a protein that is found in milk, and is usually found during the seperation of milk and cheese. It is one of the best sources of protein for us and helps support our immune systems. If you have ever been past a sports nutrition shop or health store, you may have seen those huge tubs of whey protein. Yes, it is a product used by bodybuilders or regular gym-users, but it isn't something that is specifically only for them. Girls, having a whey protein-based drink isn't going to make you build up lots of muscles and get a manly body ( we don't have enough testosterone in our systems for starters)! As the whey protein comes from milk, the drink isn't suitable for those who are vegan. The creation of this drink is great in my opinion because whilst people are becoming more aware of the importance of protein in our diets, a lot still needs to be done to encourage more of us to see protein as something good for you. Upbeat are doing a lot in this respect to remind us about the importance of protein. If you want to find out about your recomended daily intake of protein, why not play around with Upbeat's protein wheel. For those of you looking to lose weight, Upbeat is a great drink to have. It has half the amount of sugar that a lot of leading smoothie and fruit juices have. It's not something to be taken as a meal replacement, but it can be drunk any time of the day, preferably breakfast, pre-lunch or the afternoon...all those times when your cravings for the biscuit tin are at a high. If you drink this instead, I promise you that you won't be eyeing up any of those naughty, naughty snacks! Even if you aren't on a weight-loss regime, this drink is super because our entire bodies use protein for things like supporting our immune systems; consuming a variety of protein is better than cosuming one type of protein as you get different nutrients from each source. Drinking Upbeat will therefore help to vary your protein source! So which Upbeat did I prefer? I'll be very honest here. I used to drink a lot of milk; my friends found that quite amusing! When I started increasing the changes to what I ate, I noticed my taste buds became more sensitive and I stopped liking dairy milk so I switched to almond and soya milk. Upbeat doesn't taste like milk as such. The fruity flavours soften the dairy taste and despite the use of sweetners, it doesn't taste sugary or overly sweet. Also, I found that the drinks smelt and tasted exactly like their flavours; mango & passion fruit and strawberry, which is perhaps due to the fact they use fresh fruit. I'm never really a fan of strawberry flavoured drinks, but Upbeat's strawberry flavour exceeded my expectations as it didn't taste sugary nor did it have that artificial strawberry taste like Lucozade strawberry. The strawberry flavour is very suited for those warmer days, and as I found it much lighter than mango & passion fruit, I usually had it with a banana or apple as a midday snack and that filled me up until my gym sessions after work. Where will Upbeat take you? I liked the mango & passion fruit flavour, but it felt a lot heavier and slightly thicker than strawberry so I never ate anything else as it was still quite filling. It didn't taste as fresh as the strawberry flavour, even though all Upbeat drinks contain fresh fruit and whey from fresh milk. For that reason, I would say I preferred the strawberry flavour but only by a small margin! I disliked the fact Upbeat drinks contained sucralose (a sweetener, also known as splenda). However, they are looking at adding natural sweeteners instead in the future. For me, I wouldn't take this as a daily post-workout drink, purely because I have my protein shakes and for £1.79 it's quite pricey to buy every day. I would, however, buy Upbeat as post-workout fuel on those days I forget my protein shake. Perhaps if they do want more of us to drink it as post-workout fuel, they could sell it at the different milk bottle sizes (1 pint, 2 pints etc). Instead, this is something I would have during the day whilst I'm busy at work, and as Upbeat's motto goes, 'fuelling the gap' between my main meals or as a breakfast substitute to help me get a steady protein intake. I think it would also be great if they created a cacao or dark chocolate flavour. Where, oh where, can I buy Upbeat? It's a 250 ml bottle and can be purchased from Tesco, Ocado, WHSmith, The Booth, The Co-Op and most Holland & Barretts branches (Londoners, I found that the H&B Westfields doesn't stock it, for example, but the H&B at Bond Street station does). It is sold for £1.79. So what are you waiting for? Head over to the Upbeat site to find your nearest store, buy the drink and start Feeling Upbeat! P.S. Upbeat is currently on offer at Tesco until 16th September and at Waitrose until 9th September 2014. Hurry before the offers end! Disclosure: Upbeat provided me with complimentary vouchers for their drinks. This review and all my opinions are honest and all my own.